You can read all about my other experiences here and here. It was the next-to-last day of school, and my daughter needed to purchase a birthday gift for a party later that day. I’m not one of those Pinterest moms or even half-good moms who keeps stacks of general party gifts on hand for these types of things. I’m not one who buys gifts for my kids to give to their friends, either. Sue me. My kid said “birthday gift” and I said “get your money” and off we went. She wanted to get her friend a gift certificate for a specific clothing store, and instead of whining and crying that it was so far away and that I had important lying around to do, I willingly agreed to drive her there with nary a cross word. What prompted this onset of goodwill mommy behavior, you ask? Well, let me tell you. Because right next door to the gift card store lies a huge health and beauty store. One that features a central area full of perfumes. And just like that, Scent Search Day 3 presented itself. She sprang to action, returned my steely gaze, set her jaw and nodded snappishly. I had chosen a worthy comrade for the next phase of my mission. I scanned the names on the first display as my daughter moved silently past me, a few shelves down. I instructed her to bring to me anything that she might love immediately, but to be selective. Unfazed, she continued. “Well, just to let you know, if you spend forty dollars in fragrances today, you get a free beach bag. You get your choice of blue and yellow, pink and green, or orange and white.” She waved her arm Vanna White style over the display of beach bags. Momentarily distracted by the prospect of free items, I meekly asked when the sale would end. After answering, she sauntered away and I shook my head to clear my focus. Keep it together, man! I admonished myself. Thierry Mugler and Bvlgari fragrances were first on the shelf, and I sprayed haphazardly and took in the scent of Angel, thé blanc and thé vert, the latter two fragrances I love as bath products but was sad to find not so much as perfumes. Making my way to the back of the first island, I was dismayed to find few names on my list. Juicy Couture! my daughter screeched. Oooo, Mom, this one is good, she crooned. I took a whiff. Very fruity and sweet. I liked it, but not for me. More for her. I spotted Coach. Everyone loves Coach, I said. I sprayed Poppy, Poppy Flower, and Signature. They all smelled the same. I remembered a former saleslady’s warning about this very disastrous issue, and took another hit of the coffee beans. Nostrils cleared, I tried Poppy again. Again, very nice, but not for me. We tried Marc Jacobs, none of which were on my list. We liked Honey and Dot but none of the others. I didn’t like any of the Michael Kors scents, despite really enjoying Michael Kors as a person. I grew nervous. What if I don't find something I love? Banishing fatalism, I forged ahead. There’s Ralph Lauren, I thought. Romance was on my list, one that I remembered from my teen years – I had stolen this time after time from my mother’s dresser. I tried it for old time’s sake, then spritzed Ralph Fresh, and fell in love. I penned the name on the strip. DKNY Be Delicious was delicious, but too fruity. My skin will eat you, I announced to the bottle. While I marked DK Liquid Cashmere’s tester, another saleslady threatened to join us. I stared her down. “We don’t need any help,” I said, white-knuckling my stack of testers. On a roll, I moved onto the next area, and found a set of pretty glass jars from Vince Camuto. No one had mentioned these, I thought. I might have lost consciousness a little upon testing the aptly-named Bella. Wiping the drool off my chin, I tried Amore and Fiori which came in at close seconds. 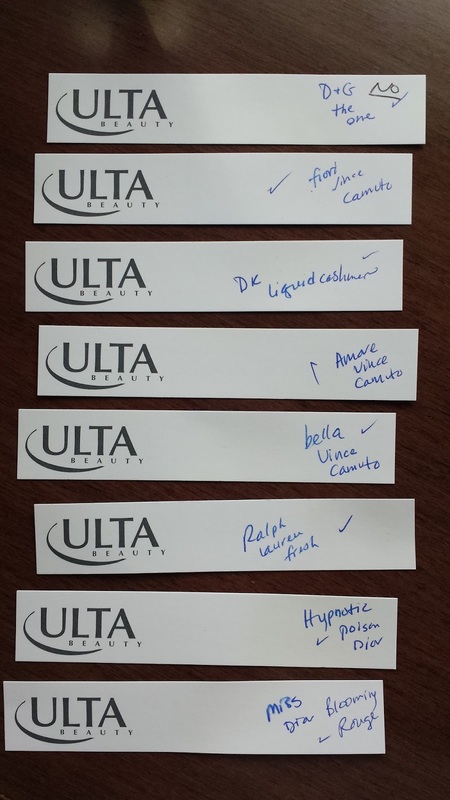 I labeled each of their test strips. Skipping past the Calvin Kleins, Chanels, Cliniques, and Guccis to the Dolce & Gabbanas, I sampled Light Blue among some of their other offerings, including The One. This is The One, I asserted, as I closed my eyes to better inhale the aroma of this beautiful scent that made the top of my head touch the ceiling. This is it, I repeated. I vowed to walk out of the store bathed in this scent. Thrilled, I moved onto Dior, where my daughter was presently swooning over Hypnotic Poison, one of the names on my list. As she shoved her tester up my right nostril in her excitement, I agreed that it was a worthy scent. 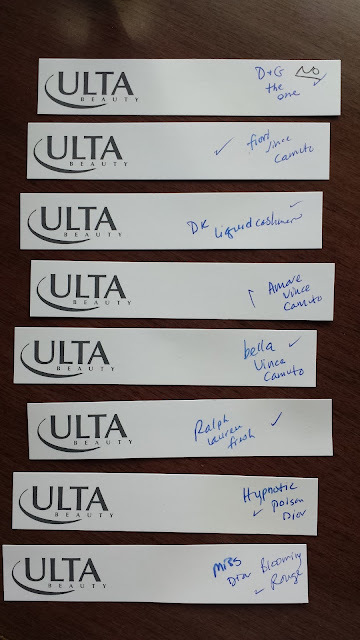 I scrawled the name on the tester and moved onto the other Diors. Miss Dior Blooming Rouge was also a crowd favorite. The rest of the visit was rounded out by the various Giorgio Armanis, which didn’t harness either of our hearts. I had made my decision. Bella and The One were each claiming an arm for the day. I doused each one with scent, grabbed my daughter’s hand and ran outside. Back in the car, we chatted about our adventure. That was fun! my daughter exclaimed. I liked the Juicy one the best, she said. Which one did you like? she asked. I liked several, but only time will reveal the favorite, I explained. Each of them will play out differently on my arm and on the testers as time goes on, and I will make my decision from there. As we drove home, my head was full of The One. This is a strong scent. As the miles wore on, I began hating it a little. By the time we pulled into the garage, I began thinking how lucky starfish are that they can regenerate a limb if it gets lopped off. There was no way to release my nostrils of the overwhelming powdery scent that The One left on my skin. Scrawling “NO” in large letters on the tester, I marveled how quickly a scent can turn on you. The One didn't make it, but some others got my attention more as their fragrances softened. I can feel my desire to make a decision growing more urgent with each scent that I try. The time is near. I can feel it. 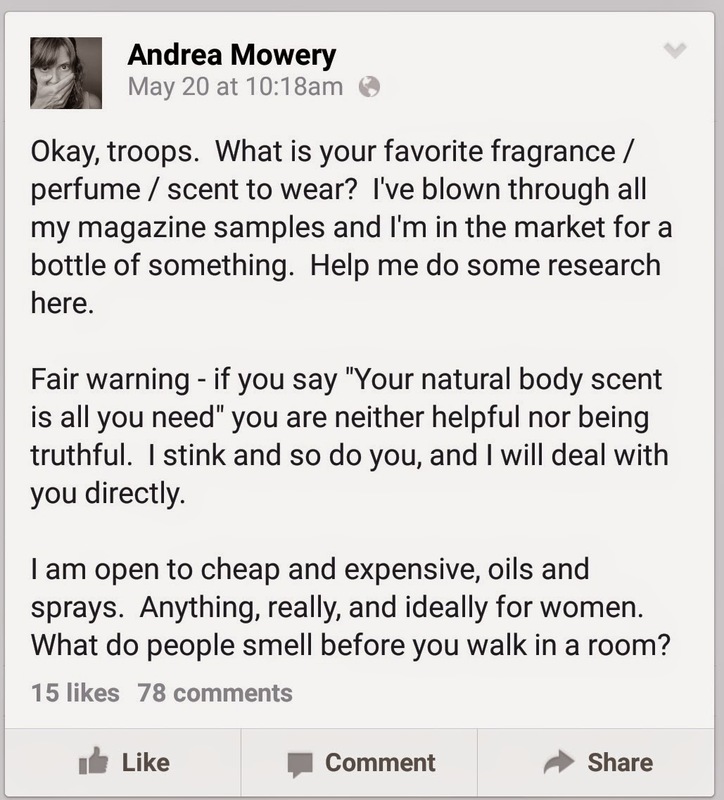 Girl, you mean BUSINESS about these perfumes!! I think I have about four different ones up on my dressor... I use them sparingly, along with whatever Bath and Body spray I received last Christmas. I have no idea the names of my perfumes, but I do know that they have been there for a good many years. Do they expire? I did notice a while ago, that one of them (Chanel? Maybe?) was half gone, despite me never using it. Ain't that a shame? Now I want to go upstairs and check them all out... neh. On second thought, sitting right here drinking my coffee is best. I am in the zone about finding the perfect perfume. My problem is that I haven't found any samples that blow me away, just a bunch that I sort of like. I want to find something that brings me to my knees. I don't think that's unreasonable, is it? Practice your stare-down to ward off the well-meaning sales staff, and you should be fine. 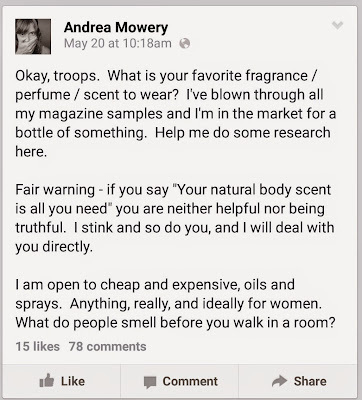 Absolutely the one thing a person does not need while searching for a new perfume is help from salespeople. I am absolutely haphazard and mostly buy on impulse. But, I know the kind of scents I like so I don't usually regret my decisions.